Offended Muslims, mostly from poor or invaded countries - offended due to so much under so long - express now their rage against those representing Denmark. In the minds of many, Denmark is nowadays associated with the happenings around the provoking – and for some unholy – drawings in Jyllandsposten. 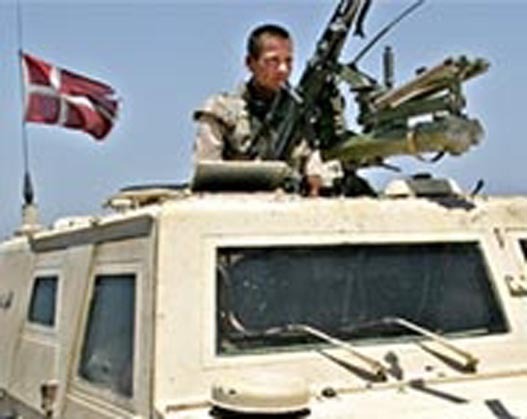 However, in the hearts of many more, Denmark is also identified with the torture of Muslims war-prisoners in Iraq, with the alliance to a lie (the weapons of mass destruction issue), and with their own troops in a war of decimation, lives slaughter, amputations in scale, bombarded hospitals and huge "collateral damage" amid vast sectors of the civil - Muslim - population. Muslims, particularly those hit by sand and blood, believe that the current European campaign has nothing to do with “freedom of the press”, that is not about “free the women”. I guess that many have also understood that it isn't about religion or "Christian values" either. They do believe that all we want is their oil, and that we are getting desperate. And possibly we are. At least judging of the Swedish media. The world media, including USA and the vast majority of the European media, have taken a careful stand, or even condemn the publication of offensive material. 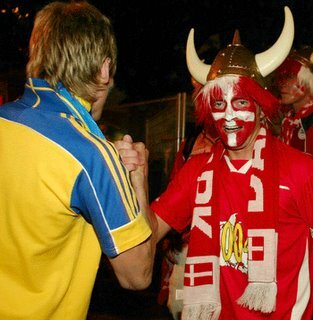 In Sweden, for the political (not religious, not cultural) reasons we will analyze separately, we have seen however a consistent trend appealing to the public to understand all this as if Muslims are conflicting against a) directly the Swedes as such, b) or directly against the "Nordic countries", c) or directly against "Sweden and other Nordic countries". For this, some of the Swedish media, or the political and economic interests they represent, have to make some efforts in "twisting" the presentation of facts, to make them appear politically correct. Certainly this does not apply to all Swedish media, neither to all journalists, editors or producers working in the Swedish communication and media business. Other main papers, and other main television channels, have reported the facts accurately and with a sense of civil responsibility. We shall se here how a little of the above has been intended with the help of "deforming" news through omitting vital information in the released news, in the presentation of news out of contex, or in contents wich are dirtectly detrimental in their association. "Nordic observators escape from Hebron"
"Twelve Swedish and the rest of the observers of the UN TIPH-team were forced on wednesday to leave Hebron on the West, after their base was attacked by hundreds of Palestinians throwing stones." 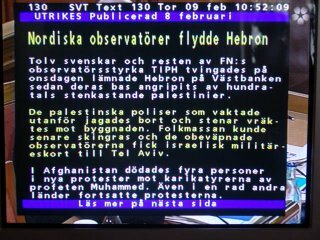 The original in Swedish: "Nordiska observatörer flydde Hebron"
"Tolv svenskar och resten av FN:s observatörsstyrka TIPH tvingades på onsdagen lämnade Hebron på Västbanken sedan deras bas angripits av hundratals stenkastande palestinier." The news came in a telegram of the News Agency TT, in which was also clearly stated that Gunhild Forselv, the Norwegian tales woman of TIPH had said that the crowd had shouted instead “Denmark out of Hebron”!. No mention was made to Sweden or any other nationality integrating that office. But that was not informed by the Swedish television. Why? the accurate and complete information regarding that matter, that the Palestinian were specifically protesting only against the Danish presence, does not go well with the political aim the Swedish media seems to get more and more attached to: that we in Sweden should believe Swedes are, or have became, "natural" targets of Muslim hostility. And of course, we have to do something about it. Note: TIPH is in fact integrated by 7o folks, including a variety of other non-Scandinavian countries such as Italy, Turkey, and Switzerland [source: Press release, Swedish Foreign Ministry, 19 January 2006]. 2. Who was "the mob" of "attacking Palestinians" "forcing Swedes to flee"? Looking at pictures and video sequences from the Italian News Agency ANSA, and reading a dispatch by J. Brilliant, a correspondent in site from United Press International, it become evident that the group of Palestinians was actually integrated by children and teenagers. The UPI dispatch quote Gunhild Forselv saying "the kids would throw stones. 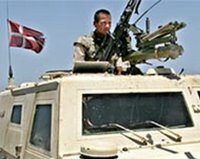 . ."
I have not yet received from ANSA the clearance I have asked to reproduce their clear graphic material, but I post here photos I took myself from the televised sending of "24" and "Rapport" 8/2, by the Swedish National Television. Please click for larger views. "In Afghanistan four persons were killed in protests against the cartoons of Prophet Mohammed. 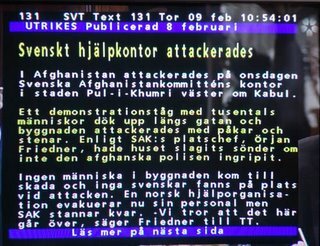 The protests continued even in other countries"
Immediately after the viewer is asked to see the page that follows ("läs mer på nästa sidan" ), in order to face the headline (see imagen below) Swedish aid-office attacked. No reason for this attack (in Afghanistan) was at all mentioned, just that a multitude in thousands attacked with sticks and stones the building where the Swedish "aid office" is located, that they were dispersed by the police, that no one was hurt, no Swedish personnel was on the place, and that no plans whatsoever for evacuation of the office was considered. Besides, it is not yet clear whether this Office is a building shared with personnel of other "Aid" categories, or other nationalities - including possibly Denmark. A new example from SVT Rapport, the most viewed television news programme in Sweden. 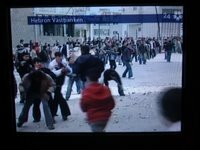 What is the analysis or explanation the Swedish (state) Television offers to the public about the ongoing conflict, beyond the particular presentation of the news we saw above? I checked this morning (9/2) SVT's website and there - among the various analyses listed under the foreign/Middle East heading - I found none about this issue. 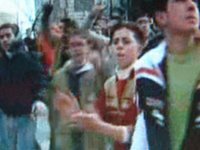 "And (the fact) that these protests have been so much extensive at so many places, is in much caused by Arabic TV-preachers" (Rapport, 8 February 2006). 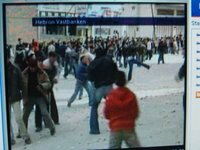 In Swedish: "Och att de har protesterna på så många håll har blivit så omfattande bero mycket på arabiska tv predikanter"